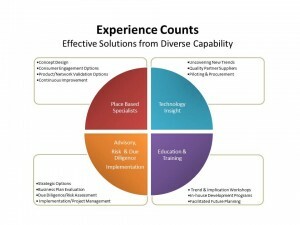 Digital Place Solutions (DPS) provides Consultancy, Sourcing and Supply assistance. Drawing from deep experience four service pools offer diverse capability – Place Based Environments; Technology Insight; Advisory and Implementation; Education and Training. Evaluate, source and supply for Eureka Funds Management a very large high quality double-sided LED banner for their Indooroopilly Shopping Centre, Brisbane. The display is 7mH x 4mW, the largest LED banner situated in any shopping centre in Queensland. Specified in 6mm pitch the display provides outstanding visual performance reflecting the high-end shopping centre environment at Indooroopilly and its quality retail brands. Suspended in a three-story atrium with a glass roof structure the project required adhering to a slim and light weight solution with an elegant suspension system. Weighing less than 1,700 kgs and only 160mm thick the outcome has exceeded the clients expectations. Evaluate, source and supply a large high quality double-sided LED banner for The GPT Group’s Highpoint Shopping Centre, Melbourne. This is the second project for The GPT Group undertaken by DPS and specifying NanoLumens LED. 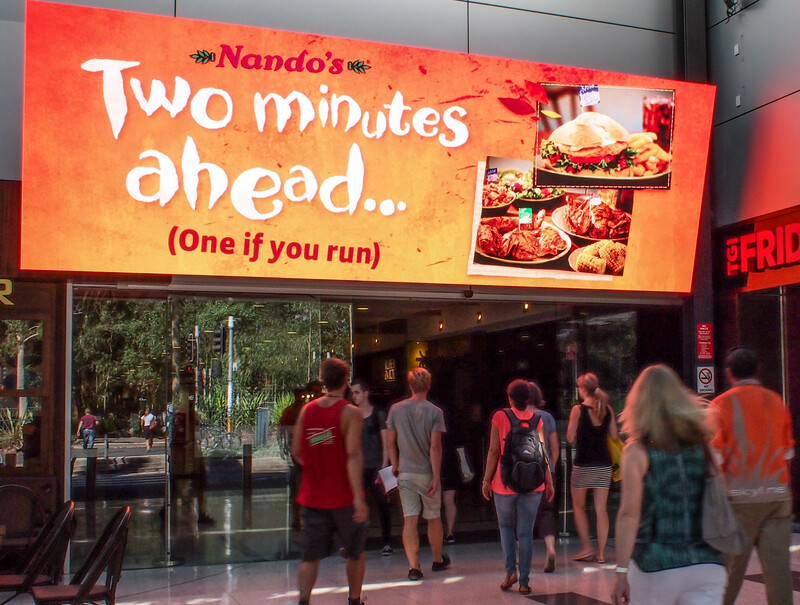 The 5.8mH x 3.2mW LED banner hangs in an atrium with very high natural light conditions. One face receives between 4 and 5 hours of direct sunlight each day. NanoLumens produced a 3000 Nits brightness solution display with independent light sensor capability to optimise brightness levels through the day and evening for each face. As this banner is slightly smaller than the Melbourne Central Tower display the banner was specified in 5mm hi-resolution pitch enabling an identical resolution outcome for both displays, thus ensuring a consistent high quality visual outcome for client’s creative content. DPS supported Atlanta LED specialist NanoLumens Inc. and Portland, Oregon-based design firm Downstream to achieve the goal of realizing a digitally intimate experience through the creation of three unique digital connection zones for Telstra’s newly redesigned Customer Insight Center (CIC) in Sydney, featuring state-of-the-art business solutions. The zones consist of a 300-seat auditorium whose focal point is the NanoLumens NanoSlim Engage 2.5MM native 4K LED screen display. The 7.5-metre X 7.5-metre screen display (56 sqm) is the very essence of digital intimacy, bringing incredibly high resolution images into the theatre. That theme is extended to the centre’s Partnership Hub — a Stonehenge-like assembly of three 4.5-mm pixel-pitch NanoCurve displays (3.02m x 4.3m; 3.02m x 8.3m; and 3.02m x 3.46m) that go from floor to a reflective ceiling and create an immersive space where product and services solutions take on both intimacy and immediacy. The centre’s Insight Ring, which uses a 1.87m x 7.34m NanoCurve display in 4.5MM pixel pitch, accomplishes this immersive effect within a unique curved space that is enveloped by a circular enclosure that’s suspended at 17 degrees in the centre’s newly created visitor reception area to convey at once a sense of intimacy and openness. Only NanoLumens uniquely flexible true curve Nixels could achieve the Downstream designs for Telstra. Respond to tender, source and supply a large high quality double-sided LED banner for The GPT Group’s Melbourne Central Tower, Melbourne. The 6.7m x 3.8m NanoLumens 6mm hi-resolution LED display chosen is suspended in an iconic conical shaped atrium, above one of Melbourne CBD’s busiest retail and transit hubs. The display provides GPT a new 3rd party revenue source as well as enabling communication and engagement opportunities directly with shoppers and commuters. This solution delivered on all of GPT’s key objectives including – light weight, high resolution, slim form factor, high sustainability credentials including negligible radiated heat and recycled components. Respond to brief, consult and supply to a procurement brief for three new LED display locations within a major Australian retail re-development, the AMP Capital Shopping Centres Macquarie Centre in Sydney. Evaluate the suitability of the brief, offer observations and fresh commercial input, all of which has ultimately varied the brief for an improved visual impact and assisted the revenue potential. One of the displays is a unique iconic design of 22m x 3m developed especially for the centre and mounted hanging from an atrium ceiling with a curve feature at each end. Provide revenue optimisation insight and technology options for the Panasonic 6mm and 10mm LED displays including custom content recommendations with a goal to ensure the long term investment is not prematurely outdated. Assess additional opportunities out side of the brief that may deliver new incremental revenue opportunities. Respond and supply a quality hi-resolution LED display for inclusion in the redevelopment of a high profile office building in the CBD of Wellington, New Zealand. The NanoLumens display solution features two straight sections linked with a continuous curve in 5mm SMD LED producing a high visual impact. The LED display, set into a floating bulkhead, is suspended in the newly constructed atrium that houses the main reception and an informal café. Source and coordinate the supply of Panasonic LED displays for a new media network developed in Sydney’s rail transit network. Key goals included tight resolution, speed of hardware delivery, low cost base while being brand and service conscious. 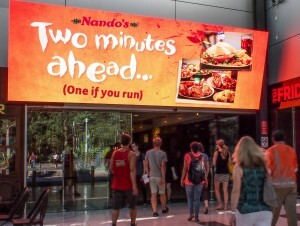 The final selection included Panasonic 4mm and 6mm LED displays in three formats across some 13 internal locations. Evaluate consumer journey options for an iconic Australian public precinct in Adelaide. Develop a digital engagement strategy designed to be effective long term 24/7 – including digital and traditional signage, way finding, mobile device opportunities, content implications, developing a particular ambience and options for pursue revenue generating sponsorships. Evaluate a business plan to transform a traditional OOH network to a digital platform in North America. Assess capital and operating cost implications, incremental revenue potential, procurement and deployment options and time frames for implementation and commissioning. Simultaneously undertake a project risk assessment and document further due diligence worth considering before proceeding to approval and execution.